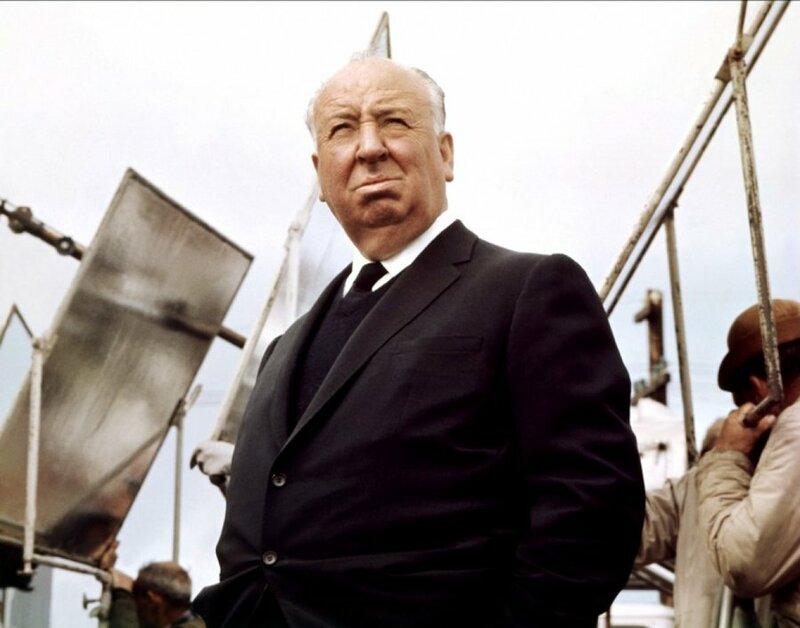 Sir Alfred Joseph Hitchcock KBE was a British film director and producer, often referred to as "The Master of Suspense" due to his mastery of the suspense thriller genre. In a career spanning six decades he directed over fifty feature films, many of which are now regarded as classics, including The 39 Steps (1935), The Lady Vanishes (1938), Notorious (1946), Rear Window (1954), Vertigo (1958), North by Northwest (1959), Psycho (1960) and The Birds (1963). He began working in the British film industry at the start of the 1920s as a title designer before progressing to become a director. He directed 23 films during the first phase of his career in England, including Blackmail (1929), one of the early British sound films. He married fellow worker Alma Reville in 1926 and she remained a key collaborator throughout his career. By the late 1930s, his profile was rising internationally and he moved to Hollywood in 1939 to work for David O. Selznick on the Academy Award winning Rebecca (1940). A series of well-received films during the 1940s led to Hitchcock briefly forming the independent company Transatlantic Pictures before entering his "golden decade" making films for Warner Bros. and Paramount Studios during the 1950s. Throughout his career, Hitchcock strove to maintain a highly visible public profile and remains one of the most easily recognisable film directors. As well as licensing his name for use by publishers, he hosted 360 episodes of television anthology series Alfred Hitchcock Presents (1955-62) and The Alfred Hitchcock Hour (1962-65). Following the release of Psycho (1960), he signed to Universal Pictures for whom he made 6 films before his death in April 1980. Despite frequently having a high degree of creative control and freedom, he regularly returned to favoured themes and his films often portray innocent people caught up in circumstances beyond their control or understanding. Although often regarded as a skilled entertainment director by many contemporary journalists, the French New Wave critics of Cahiers du Cinéma argued that Hitchcock film's should be regarded as artistic masterworks and he became a key figure in the emergent Auteur Theory. Hitchcock is seen today as a director who managed to combine art and entertainment in a way very few have ever matched. His innovations and vision have influenced a great number of filmmakers, producers and actors. He remains by far the most-studied film director of all time. Alfred Joseph Hitchcock was born in Leytonstone, Essex, on Sunday 13 August 1899, the youngest of the 3 children of local greengrocer William Hitchcock and his wife, Emma Jane. By 1908, William Hitchcock had followed his brothers into the fishmongery trade and moved his family to Salmon Lane in East London. A couple of years later, 11 year old Alfred was enrolled at St. Ignatius College, a Jesuit Catholic secondary school in Stamford Hill, London. Following the death of his father in December 1914, Hitchcock began working at W.T. Henley's Telegraph Works Company Ltd. It was here that he developed his artistic skills and eventually joined the company's advertising department. During this period, he frequently visited London theatres and cinemas, and began considering a career in the arts. In April 1919, the American company Famous Players-Lasky announced its intention to open a new modern film studio in Islington, London. Following the opening of the studio in May 1920 and the announcement of the first planned productions, Hitchcock managed to gain a part-time position designing intertitle cards. An enthusiastic worker, he soon picked up other film production skills, including scenario writing and set design. His future wife, Alma Reville, had entered the film trade several years earlier and began working at the Islington Studios around the same time. However, it would be a couple of years before he felt comfortable enough to begin courting her. They eventually married in December 1926 and their only daughter, Patricia, was born in July 1928. By 1922, Famous Players-Lasky was suffering financial problems and began winding down their British operations, leasing out their studios and staff to other film producers. It was during this period that Hitchcock became an assistant director, achieving commercial success on the Balcon, Freedman & Saville production, Woman to Woman (1923), directed by Graham Cutts. Producer Michael Balcon formed Gainsborough Pictures in 1924, taking over ownership of the Islington Studios. Impressed with the enthusiastic young Hitchcock, Balcon arranged a partnership deal with German studios UFA and Emelka, giving Hitchcock the opportunity to study German film production techniques and then to direct his first full-length feature film, The Pleasure Garden (1925). Although Hitchcock's first two films received critical approval from the press, Gainsborough's distributor C.M. Woolf felt they lacked commercial appeal and their release was blocked until the success of The Lodger: A Story of the London Fog (1927). During the summer of 1926, it was announced that Hitchcock would leave Gainsborough and join John Maxwell's British International Pictures (BIP), where he became England's highest paid director. Over the next 6 years, he directed 10 films for the company, including the commercially successful The Ring (1927) and Blackmail (1929), the latter being promoted as England's first "talkie". An apparent falling out with BIP management led to his contract not being renewed in May 1933. Whilst subsequently working on the independent production Waltzes from Vienna (1934), Hitchcock reestablished his acquaintanceship with Michael Balcon and signed a contract with Balcon's new company, Gaumont-British. Having previously experimented with several different genres of film for BIP, Hitchcock settled into the suspense thriller genre with Gaumont, producing a run of six commercially successful films for the studio: The Man Who Knew Too Much (1934), The 39 Steps (1935), Secret Agent (1936), Sabotage (1936), Young and Innocent (1937) and The Lady Vanishes (1938). Whilst Balcon's attempts to break Gamount into the US market failed, some of Hitchcock's films were moderately successful in America and this led to the director making two trips — one to New York (1937) and another to Los Angeles (1938) — in an attempt to secure a favourable Hollywood contract. Following the critical success of The Lady Vanishes, Hitchcock signed a contract with David O. Selznick and the Hitchcock family left England in March 1939 to start a new life in America. Between 1940 and 1947, Hitchcock remained under contract to Selznick, for whom he directed four films, including Rebecca (1940) and Notorious (1946). During this period, he also made six films for other studios, in a loan-out arrangement which financially benefited Selznick — these included Suspicion (1941) for RKO, Shadow of a Doubt (1943) for Universal, and Lifeboat (1944) for 20th Century Fox. During World War II, Hitchcock renewed his friendship with Sidney Bernstein and worked on a number of projects for the British Ministry of Information. With the end of his Selznick contract in sight, Hitchcock and Bernstein began planning a new production company which would allow the director to work independently of the studio system and Transatlantic Pictures was officially launched in April 1946. Hitchcock's first two films for Transatlantic — Rope (1948) and Under Capricorn (1949) — proved commercially unsuccessful and the company's distribution partner, Warner Bros., took over production of Stage Fright (1950) prior to Transatlantic being dissolved during the filming of I Confess (1953). The success of Strangers on a Train (1951) led to Hitchcock signing a short contract with Warner Bros., culminating with Dial M for Murder (1954) which starred Grace Kelly. Hitchcock had previously signed with talent agency MCA and Lew Wasserman negotiated an extremely favourable contract with Paramount Pictures for the director — as well as providing a considerable degree of artistic freedom, the rights to most of the films reverted back to Hitchcock. The films from this period include classics such as Rear Window (1954), To Catch a Thief (1955), Vertigo (1958) and North by Northwest (1959) (the latter being an MGM production). Wasserman anticipated the impact that television would have on entertainment and in the mid-1950s persuaded Hitchcock to host a television series. Although initially somewhat reluctant, the series Alfred Hitchcock Presents helped turn the director into a popular culture icon. At roughly the same time as his profile was being raised by his television series, a group of influential French film critics writing for Cahiers du Cinéma began championing Hitchcock as an auteur director whose work was worthy of serious critical appraisal. Up to that point, most film critics had regarded Hitchcock as merely a talented maker of popular entertainment films. François Truffaut's subsequent book on the director, based on a series of interviews conducted in 1962, helped cement Hitchcock's reputation. The final film under his Paramount contract proved too controversial for the studio and Psycho (1960) was instead financed and produced by Hitchcock with Paramount only handling the film's distribution. Despite concerns raised by many of the director's colleagues, the film was a huge success and the "shower scene", with it's shrieking Bernard Herrmann score, has become one of the most iconic scenes in 20th century cinema. In the early 1960s, Hitchcock cemented his partnership with MCA by transferring the rights to Psycho and his television series in return for shares in the company and, by the end of 1962, MCA had gained control of Universal Pictures. Hitchcock would remain with Universal for the rest of his career and was one of the largest shareholders in the studio. Hitchcock's first two films for Universal — The Birds (1963) and Marnie (1964) — failed to match the success of Psycho and two subsequent personal projects — Mary Rose and Kaleidoscope — were blocked by the studio's management. Instead, the studio encouraged Hitchcock to return to the spy thriller genre but both Torn Curtain (1966) and Topaz (1969) faired extremely poorly at the box office. Frenzy (1972), which was filmed in London, was regarded as a return to form for the director, although the declining health of both Alfred and Alma (who suffered a stroke during the film's production) meant that his years as a filmmaker were coming to an end. Family Plot (1976) was released to warm reviews but production on his 54th film, an adaptation of Ronald Kirkbride's novel The Short Night, were abandoned when it became obvious to Hitchcock that he was now physically incapable of directing another motion picture. In 1978, the visibly frail Hitchcock became the seventh recipient of the American Film Institute Life Achievement Award. During his acceptance speech, he paid a moving tribute to his wife: "I share my award, as I have my life, with her." At the end of 1979, he received an honourary knighthood in the Queen's New Year Honours List. Alfred Joseph Hitchcock passed away at 9:17am on Tuesday 29 April 1980. BFI Screenonline - "English Hitchcock"
BFI Screenonline - "Hitchcock's Style"
BFI Screenonline - "Silent Hitchcock"
Images Journal - "In Focus: The Cinema of Alfred Hitchcock"